Rule of Reservation is not applicable for candidates applying on Deputation Basis. The details of educational qualifications, experience, age and other eligibility criteria, duties for appointment on Direct Recruitment / Deputation basis (including relaxations, if any) for the posts along with application proforma may be accessed from web http://niphm.gov.in. 1.A First Class M.Tech. / M.E. in Agricultural Engineering with specialization in Farm Machinery and Power / Soil and Water Conservation. Specialization can be established by work experience, paper publication, subjects studied exclusively in Post-Graduation. 2. Minimum work experience of 12 years of which at least 4 years of experience in Design and Operational Management of Equipment relating to Pesticide Application, Water Technology (SWC), Quality Control aspects in Agricultural Engineering. Experience in Research, teaching / training in the respective fields will also be considered as the required work experience. 1) Ph.D in the relevant subject. 2) Master’s Degree in Agriculture / Horticulture with specialization in Plant Pathology / Entomology / Nematology , Master’s Degree in Botany with specialization in Plant Pathology , Master’s degree in Zoology with specialization in Entomology / Nematology. 3. A First or High Second Class Masters Degree in Organic Chemistry / Analytical Chemistry / Agricultural Chemistry / Agri. Entomology / Plant Pathology/ Agrichemicals & Pest Management/ environmental Science/ Environmental Chemistry/ Biotechnology. Please visit NIPHM website http://niphm.gov.in for the details of duties to be performed and for downloading the prescribed application proforma. 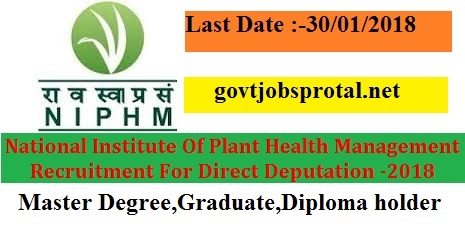 The applications in prescribed proforma (through proper channel in case of Central/ State Governments/ Universities/ Recognized Research Institutions/ PSUs / Statutory Semi-governments or Autonomous organizations candidates) should reach the Registrar, National Institute of Plant Health Management, Rajendranagar, Hyderabad 500 030, Telangana, within 30 days from date of publication in Employment newspaper by 5.30 p.m. Persons working in Govt. service should apply through proper channel only. In case it takes time to obtain clearance from the Head of Department, an advance copy of the application may be sent on or before the closing date. However the application through proper channel should reach NIPHM by the time of scrutiny, else the advance copy will not be considered. (You will get more information in employment News paper dated on 30/12/.2017 Page no.(14).) Visit the official website for more information.